The 20th Russian Team Championships took place from April 7th to 13th 2013 in Loo, which is part of the city of Sochi, one of the southernmost places of Russia. The teams had 88 grandmasters, 26 of whom sported ratings of 2700 or higher, included GMs, like Sergey Karjakin, Fabiano Caruana, Shakhriyar Mamedyarov, Alexander Grischuk, Alexander Morozevich, Vassily Ivanchuk, Peter Svidler, Peter Leko, Gata Kamsky and Dimitri Jakovenko. 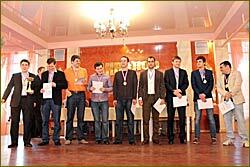 The open section was won by SPb Chess Fed (above), which represents the Chess Federation of St. Petersburg and fielded GMs Peter Svidler, 2747, Nikita Vitiugov, 2712, Leinier Dominguez Perez, 2723, Sergei Movsesian, 2695, Zahar Efimenko, 2697, Vadim Zvjaginsev, 2658, Ildar Khairullin, 2660 and Maxim Matlakov, 2653. The average rating was 2706. The second placed club Malakhit Chess Club had a rating average of 2738 and was the top seed in the event. City news archive for 15 April' 2013. City news archive for April' 2013. City news archive for 2013 year.